Main Characters : Matilda, Michael, Ms. Honey, Mr.& Mrs. Wormwood, Ms. Trunchbull, Amanda Thripp and Lavender. 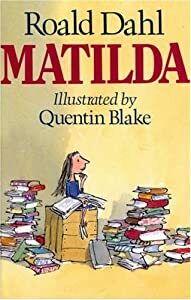 Description Of One Of The Main Characters : Ms. Trunchbull is the head-mistress of the school in which Matilda studies. She is very rough and dangerous. She doesn't like small girls. She is stupid. She always says that she has never been a small kid just because she doesn't like them. Whom I like and Why : I like Lavender as she once put a newt inside the water jug of Ms. Trunchbull when she was teaching a lesson. She is really brave and intelligent. She is Matilda’s best friend. Whom I dislike and Why : I dislike Mr. & Mrs. Wormwood, the parents of Matilda. They don't encourage her. They don't get Matilda any books to read as that is what Matilda loves to do. Mr. Wormwood is a stupid owner of a car shop. He sells stolen cars to people telling them it is a second-hand car got from a rich person. The Wormwoods always scold her for nothing. They are not very intelligent. Mrs. Wormwood loves to apply make-up and go to play bingo with her friends. You would better believe it. Then get out of here. If you don't, I will come and get you. I am watching you, Agatha. Well, Ms. Trunchbull is terrified and she faints. Matilda is smiling. Trunchbull runs out of the city afraid that Magnus would return. Now Ms. Honey has the house and the money. Mr. & Mrs. Wormwood suddenly want to shift to another country. Matilda does not want to go. She stays with Ms. Honey forever. However, her parents are happy that there is one less for them to take care of. But Matilda’s brother is really sad to leave his sister. They all are happy. Part I Enjoyed The most : I enjoyed the part when Trunchbull throws a girl because she wears pig-tails. She did it so to show her dislike of pig-tails. This is my blog where i used to write poetry-- http://wordsfloweasy.blogspot.com/... check it out when you have time!